This addition increased the mass 69 Chris45’s cargoes and replaces 10 cargoes with locomotives. The archive also has a mini add-on that is not mandatory for installation for standard trucks, which upgrades the parameters for more comfortable transportation of heavy loads (added several real tuning engines with different sounds, one gearbox and one “heavy” chassis). Mini addon did for themselves, so any criticism and claims are not accepted. P. S. If you find errors – write. It is desirable that there was a piece of log file(from game.log.txt) with a description of the error. One of the big tanks wont go under the brige out of San Francisco, did you fix that? I know . This no bug. The dimensions of some models exceed the standard ones. There may be problems in narrow / low places. Thoroughly approach the route planning. In vain … In such situations, you can use a free camera to “jump over” a difficult place. In general, you should plan the route in advance, taking into account the fact that you are transporting a oversize cargo. Re-route the trip so you end up there LATE and you just wasted 30 mins of REAL time, what sense does that make, screw this pack idiot! Write this mod to the author Сhris45. 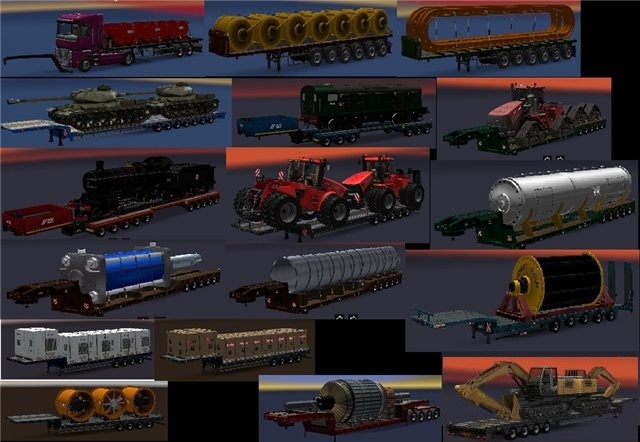 I do not have any relation to the models of trailers. For one you can scold the creators of the game for the mode of “convoy” in which too there are oversized loads.